You don’t need to dread your tasks or beat yourself up for procrastinating anymore. With the new Swift To-Do List, you now have a tool that will help you to start working in no time. It includes new countdown timer, which is the most interesting new feature, because it allows you to overcome procrastination and resistance to your tasks. If you learn to utilize the new timer feature as explained below, it can literally change your life, especially if you are struggling with procrastination or have hard time focusing and managing your attention. As you read on, you will learn how you can benefit from the new timer feature, and how it can help you to focus and overcome procrastination. Oh, and other than the timer, the new update also adds overdue tasks information in the info panel – with just 1 click, you can immediately see all overdue tasks. The new version can also email task reminders to assigned persons, and it allows you to open a folder where any file attachment is located, and much more. The new countdown timer expands the existing Time Tracking feature. Procrastination is caused by resistance. We feel resistance to tasks because the oldest and most primitive part of our brain, amygdala, is feeling threatened. It dreads the work, because it’s uncertain how long will it take or what else will you have to give up to finish it. However, this feeling can be eliminated by setting a time limit for your work session. For example, to overcome resistance to any particular task, you can say to yourself: “I am going to work just 20 minutes on this task”. Then, start the 20 minute Timer for that task. You will have no problem getting started this way. First, it eliminates resistance, because it is now obvious that you will be working for just 20 minutes, so the task is no longer perceived as a threat by your primitive part of brain. Second, it sets you free. During the countdown, you don’t have to worry about anything else. It frees you from everything else and gives you the permission to focus absolutely on that task. Once the 20 minutes have passed, you will probably continue working. You will get into flow and you can actually feel euphoric while working! 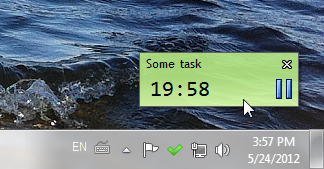 The floating timer window will constantly shift your attention to the task. It acts like a magnet for your focus, which is invaluable in today’s ADD world full of distractions. As a result, you can easily be 300% more efficient during these 20 minutes than usual. It can be quite revolutionary, actually. I’ve personally gotten some extraordinary results by using a timer, and I know of many others. It is proven. It just works. And it’s very, very effective. 20 minutes is just an example. You can use any time limit, from 5 minutes to 90 minutes. Heck, you can even set any custom number of minutes. And by the way, if you have trouble focusing, you can also use the new Timer feature in combination with Pomodoro Technique, which is basically about structuring your whole work day in short 25-minute focused bursts and 5 minute breaks. The Timer is in Ultimate and Professional editions only. And this is how the actual timer looks. On the screenshot below, you can see it on my desktop. It’s a floating window that can be set always on top, and you can of course customize the color and other things by right-clicking it. You can move it anywhere (it’s sticky). When the time is up, “Finished” will start blinking on the timer, and you can either close it or reset it to start another session. 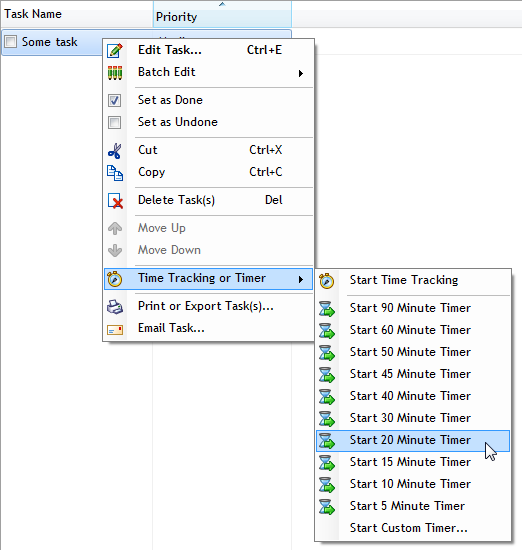 You can also set a new timer with different time limit, for a different task or the same one. Swift To-Do List keeps track of total time spent on any task when the timer or time tracker is running. If you display Time Spent column in the task-view, you will be able to see how much time have you spent total on each of your tasks. Info panel now contains “Overdue Tasks”. You can click that label and see all overdue tasks. The label displays the number of all overdue tasks. This gives you instant overview. New calendar mode, “Due Date or Start Date”. This allows you to see tasks starting OR due on any particular day (or days) with just a single click. New Filter option for Due Date and Start Date filtering: “In next 14 days”. This is similar to the “In next 7 days” option. For added convenience, you can now upgrade your license to a higher edition or purchase extra discounted copies using menu “Help – Buy Upgrades or Extra Licenses”. Attachments right-click menu now contains “Open File Location” for file attachments. This allows you to open the folder where the attachment is located. When it comes to embedded attachments, the folder from which they were embedded is opened. Email reminders can be now emailed to the person the task is assigned to. The same goes for recurrence notifications. Import from Task Coach added. You can now choose choose default task Type and default Context for your tasks. Do that using menu File – Options, then go to the New Tasks section. When creating a recurring task, the Due Date of the task is set automatically immediately based on the recurrence. E.g. if you create a task to recur in 7 days, its due date will be immediately set to 7 days from now. All you have to do is to download the latest version and install it. It’s just a few clicks away. Can these few clicks revolutionize the way you work? PS: You might be also interested in my summary of The Now Habit, which is probably the best book on procrastination. - By Jiri Novotny+, the obsessed author of the number one to-do list software for Windows, Swift To-Do List. Jiri’s life quest is to become productivity and achievement world-class expert to empower others to achieve their full potential. If you liked this post, then definitely follow this blog on G+. I made a test to try to use the new tool. Ok, honestly… I was really skeptical but I realised you are 100% right. The timer helps me dramatically in particular while doing boring tasks. I concentrate much more than usual and I’m faster and faster. Many thanks, Danilo. Any immediate plans to add feature to push calendar and task items to Google calendar in the future? Yes, we would like to support Google calendar sync in the future. It probably won’t be soon though. I would like to have an alert when the countdown finishes… Sometimes I don’t see the message “Finishes”. Does last version has this? I have the 7 version… I love this tool. When the time runs out, the message “Finished” starts blinking on the timer. Audio alert is currently not possible, but we will consider adding it if more customers request it.